Just like a local I took a weekend break from Ehl Deh Ehfeh and went to magical Tepotzlan. 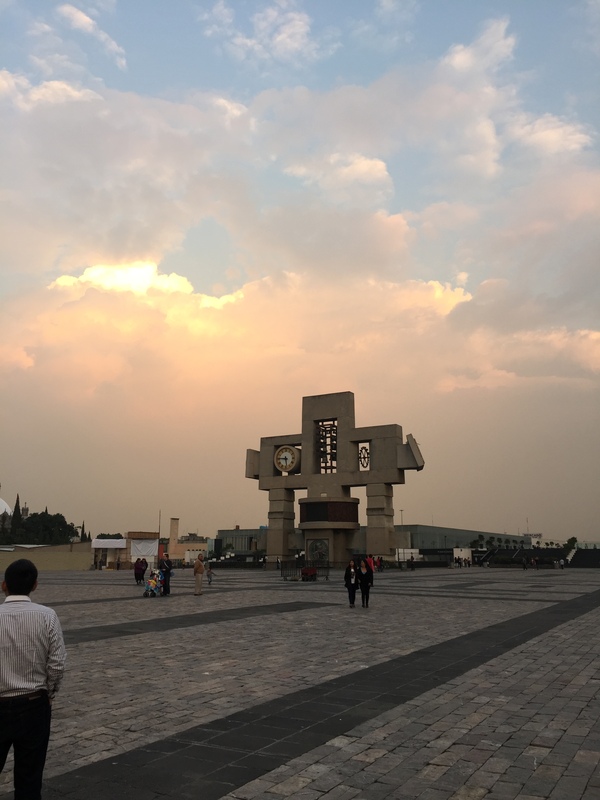 Tepotzlan is south of Mexico City. 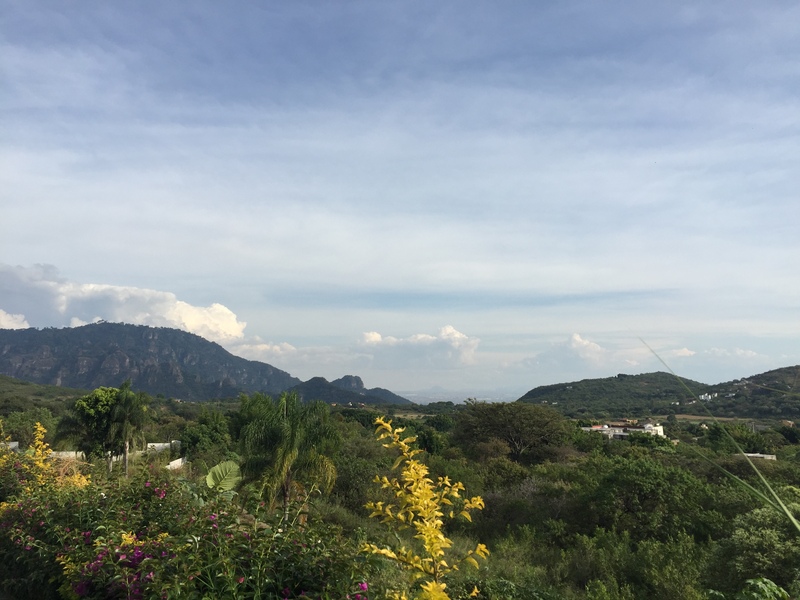 According to Mesoamerican legend, this ancient town was the birth place of Quetzalcoatl, the omnipotent serpent god of the Aztecs over 1200 years ago. 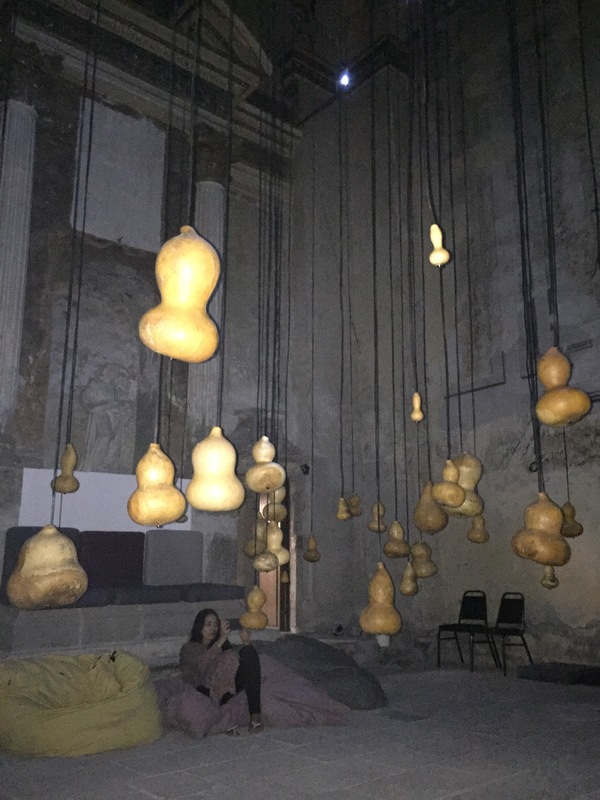 The reason wasn’t to do anything super naturopathic, but to celebrate a friends Birthday at a two day mini festival called ‘Eudaimonia.’ In my mind, a party is a ritual and good for the should in some respects, and the location was without doubt idyllic. We left at a respectable hour, mainly due to a sudden down pour that didn’t look like it was going to stop. Having relinquished all control, I had no idea where we were going to stay. We ended up in Hostal Natural Mystic. Arriving in the torrential rain, an old man opened the door holding a candle and led us to our dorm. I felt like I was going back in time in this candle lit hippie hostel. No electricity, no hot shower, no phone charging…I couldn’t have been happier to have a dry room and a bed. The following morning we went to the local market and had an amazing, Pre-Hispanica lunch. This food is what it says, indigenous food from pre the hispanic invasion, when they ate vegetarian. This is something to watch, I can see pre-hispanica restaurant chain coming soon in London or LA as we all become more conscious of the environmental effects of animal farming. Tepotzlan is lined with cobbled streets and the dramatic landscape of cliffs and mountains surrounds the pueblo. Many people flock here to feel the powerful energy. We returned to the party the following day. 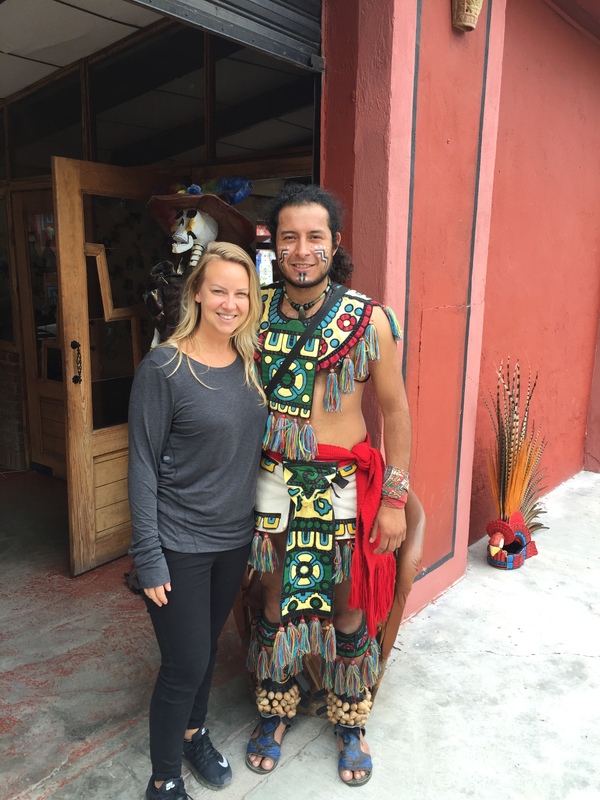 I had met a very cool Mexican girl the day before, so I was happy to talk more with her the following day. When we first started talking I explained to her what I had been studying in LA and the project I had done in the last year about death and grieving. She was very interested to hear about my work and she shared about the death of her Father when she was 13 years old. We talked about Dia de Los Muertos and she explained to me that this was the first year she had made an ‘Offerenda’ to him. A reminder that there is no time span on grief, I think it took me 20 years to start to process the grief from my Fathers death. I was very grateful to meet her and share such personal conversations. I was tempted to stay an extra night because it was a Super Moon and it would have looked so beautiful there. 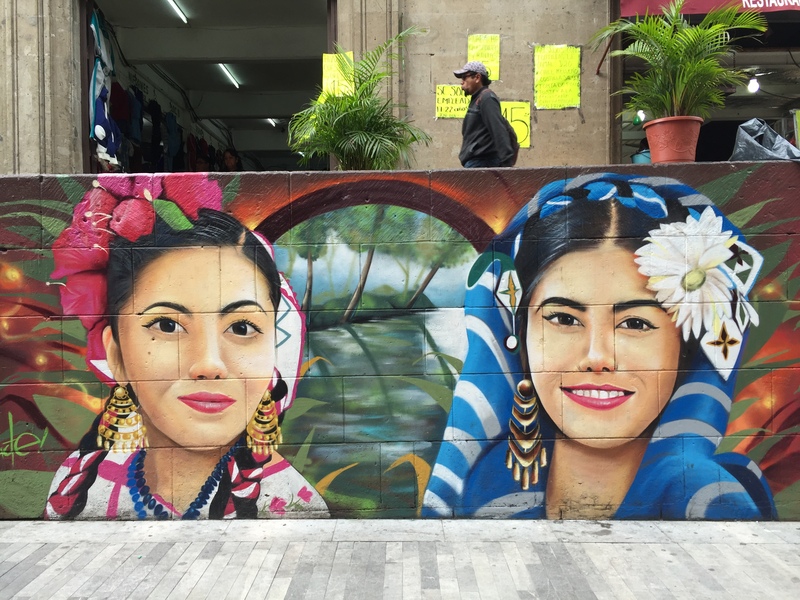 But I took a ride back to DF with the friends I went with and walked through Downtown Mexico City at night which became a totally different, but equally magical experience. 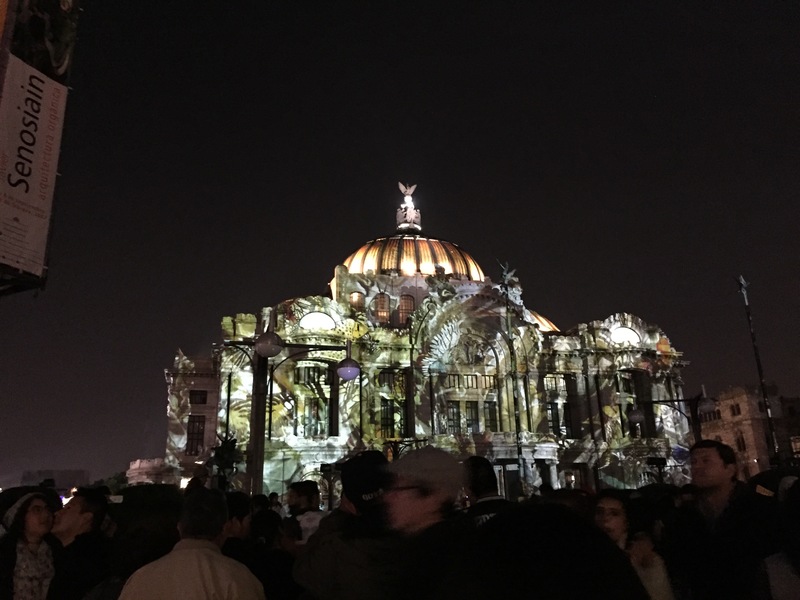 This was my first visit to the Centro Historico, I walked past the breathtaking Palacio de Bellas Artes which had a light show and music playing outide. The combination of the incredible lighting and the modern music against this historical back drop, the energy of all the people around enjoying the show and being slightly high myself, made this one of the most special moments of my trip so far. 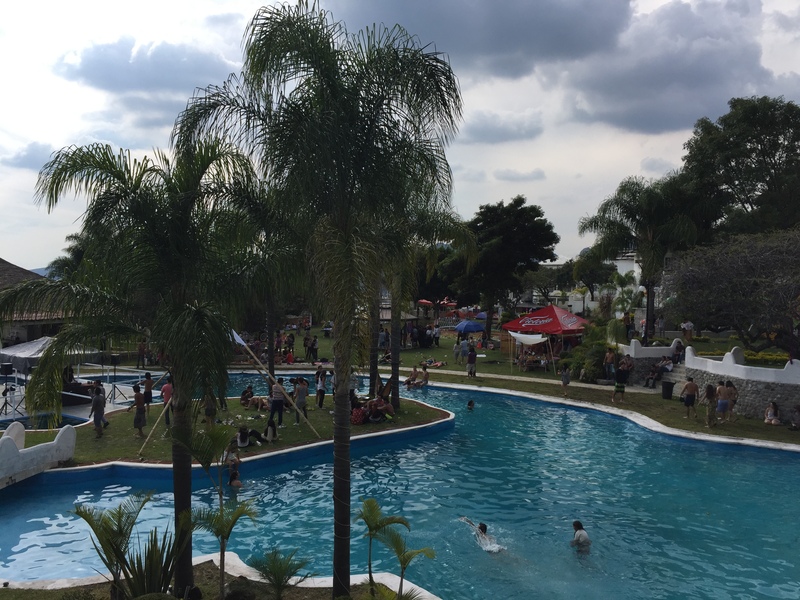 If I had stayed in Tepotzlan, I am sure I would have had an amazing night but I would not have changed that moment in the Downtown for anything. I met up with a friend from LA, Samirah and her husband, Manuel. We ate at Frutos Prohibidos, a vegetarian restaurant, of which there are many in Mexico City. This is a great place omnivores! 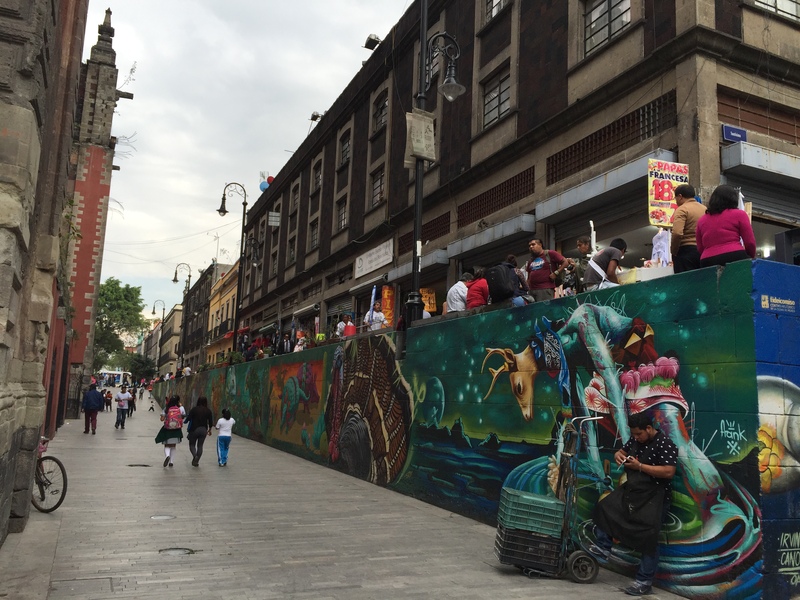 Then we headed back to Downtown, Centro de Historico. I was eager to experience this area in daylight. 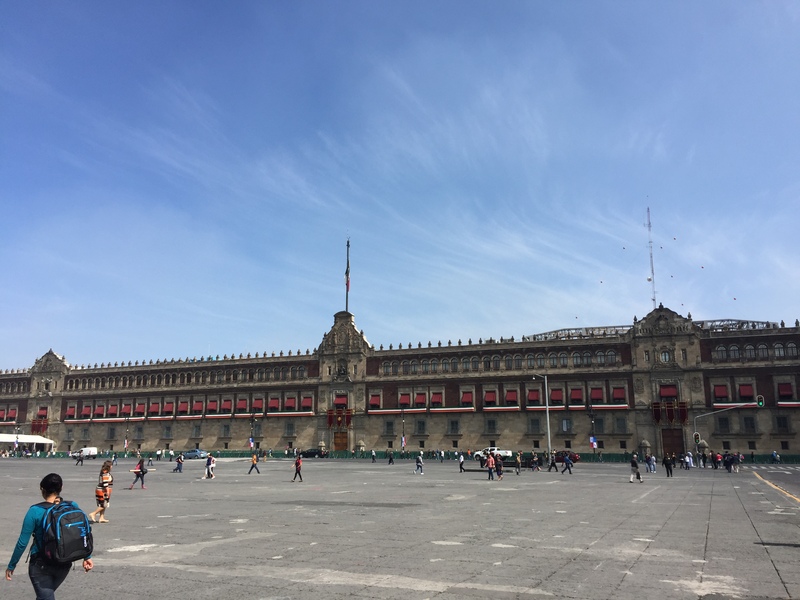 First stop was ‘Zocalo’ the largest plaza in Latin America which can hold up to 100, 000 people as a venue for cultural events. 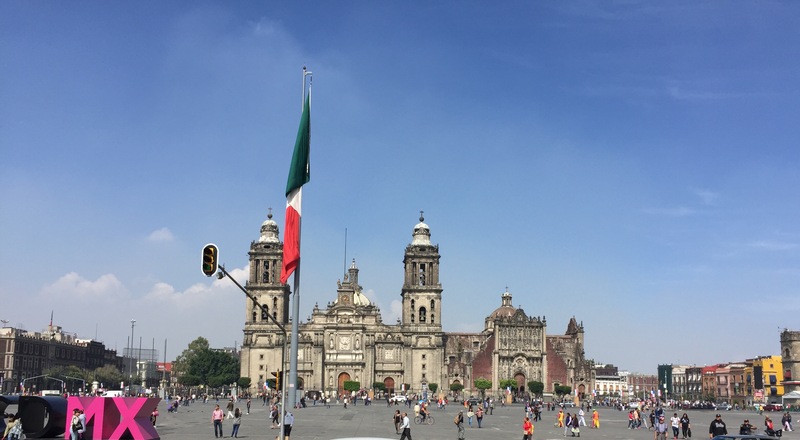 Mexico City was originally built on a Lake and many of the buildings are tilted which you can kind of see in this photo..
Admin day to book flights and enjoy wondering around Roma Condessa some more. I also sent a package back to LA, a result of my overpacking too many shoes…! I had breakfast with an artist whom I will write a separate blog about. 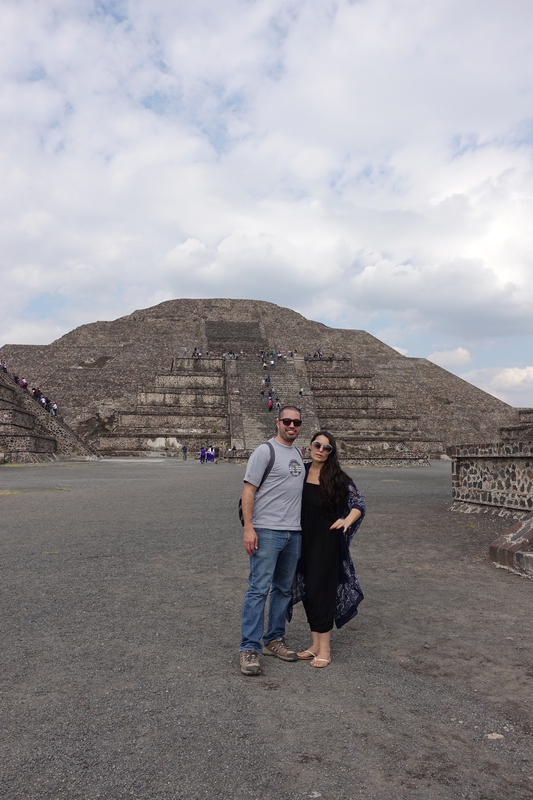 Finally I made it to Teotihuacan to see the Pyramids and thankfully there was no rain all day! We took an organised tour which I was grateful for, we got a lot more out of the day than we bargained for. First stop was a museum to see some the archeological findings of the original city. 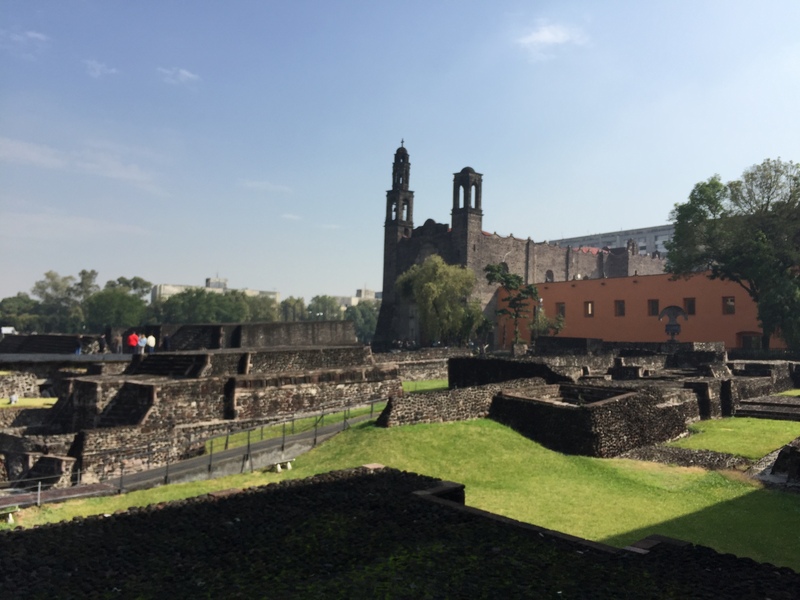 These ruins were next to the very first school in Mexico City. 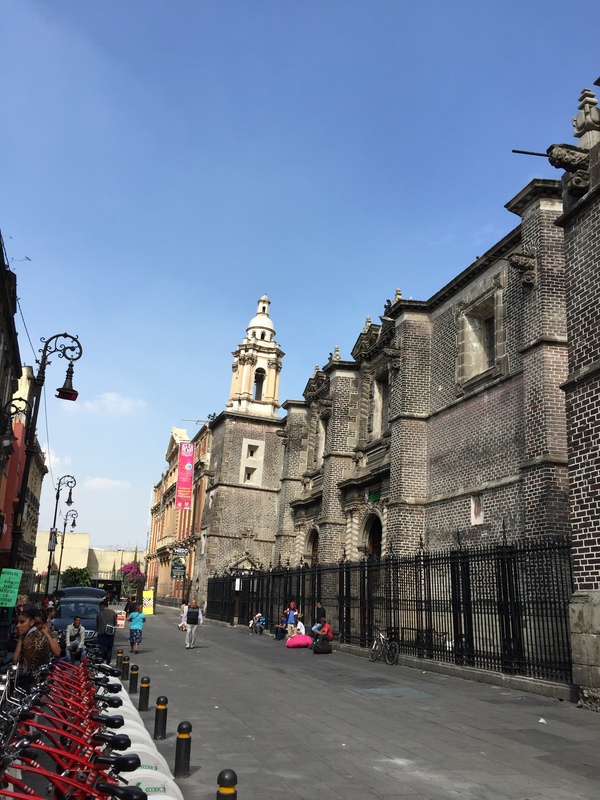 And the next stop..about 40 kilometres north of Mexico City stands the ancient Mesoamerican city built in the pre-Columbian America’s, around 100BC. 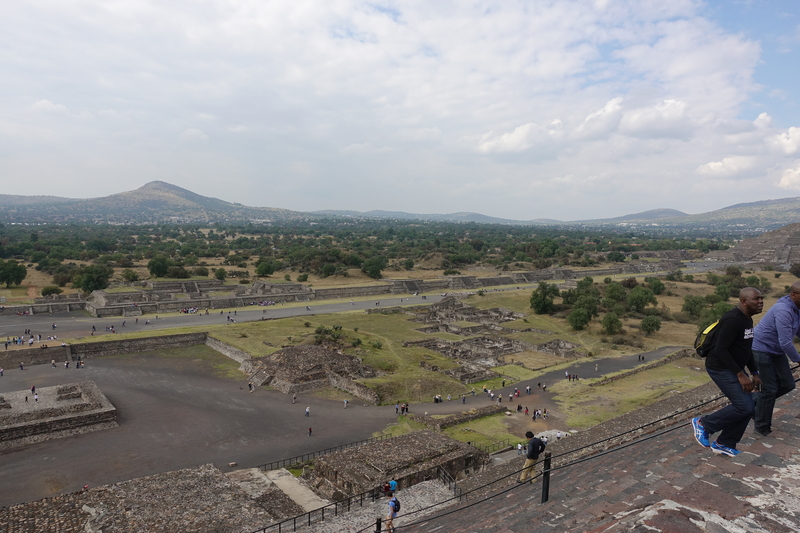 The ‘Pyramid of the Sun’ is the third largest in the world after the Great Pyramid of Cholula (in Mexico) and the Great Pyramid of Giza (Egypt). 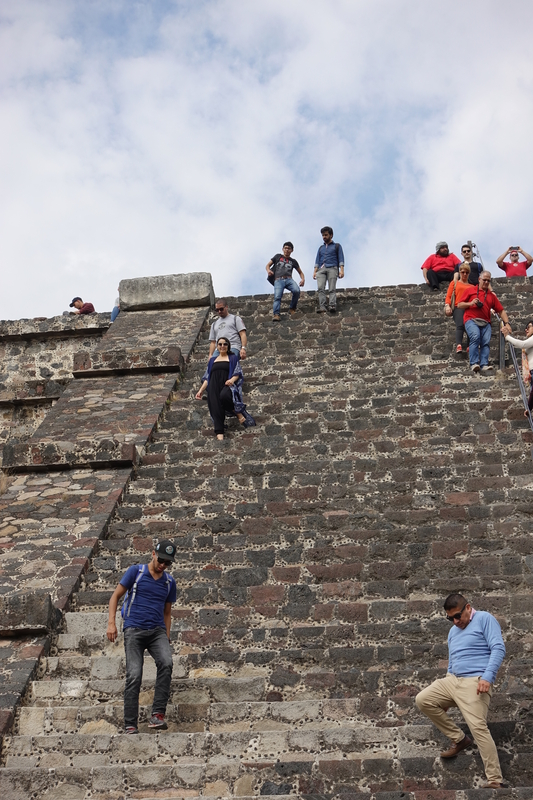 Here I am looking at the Pyramid of the Sun! We ate lunch at a touristic spot, but it was fun and we tasted lots of different Mezcals, Tequila’s and Pulke! 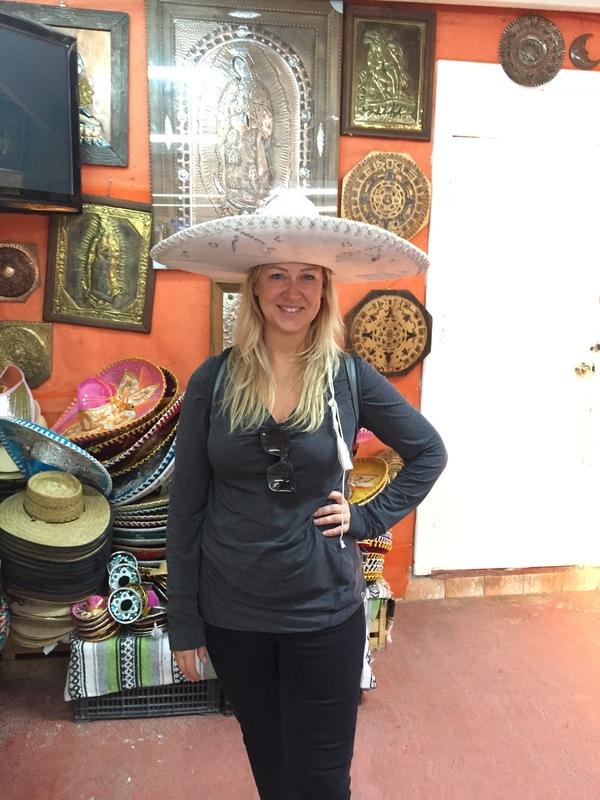 I tried on some Poncho’s and Sombrero’s. 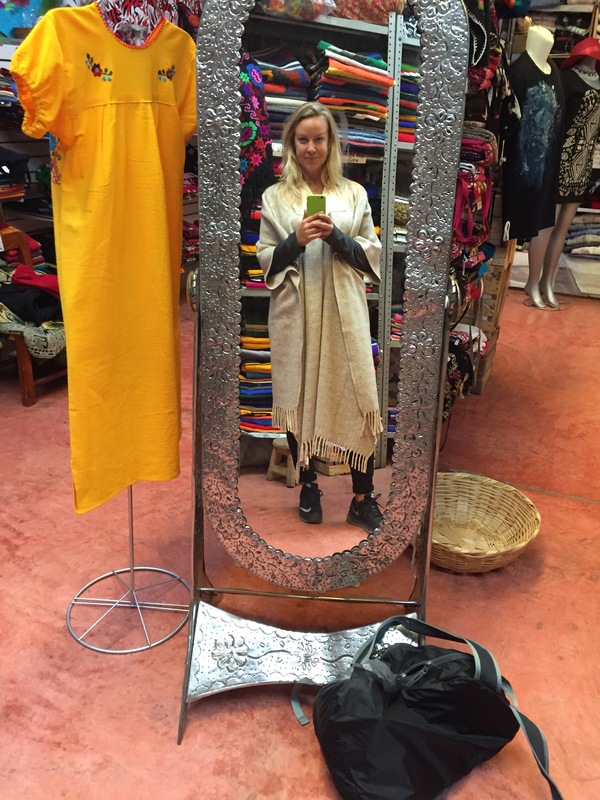 Another poncho I am likely to regret buying, but seriously trying to hold back on all temptation because I can barely carry what I have and in all seriousness, do I need more clothes? No. To finish the day we were taken to Basilica de Guadalalupe. 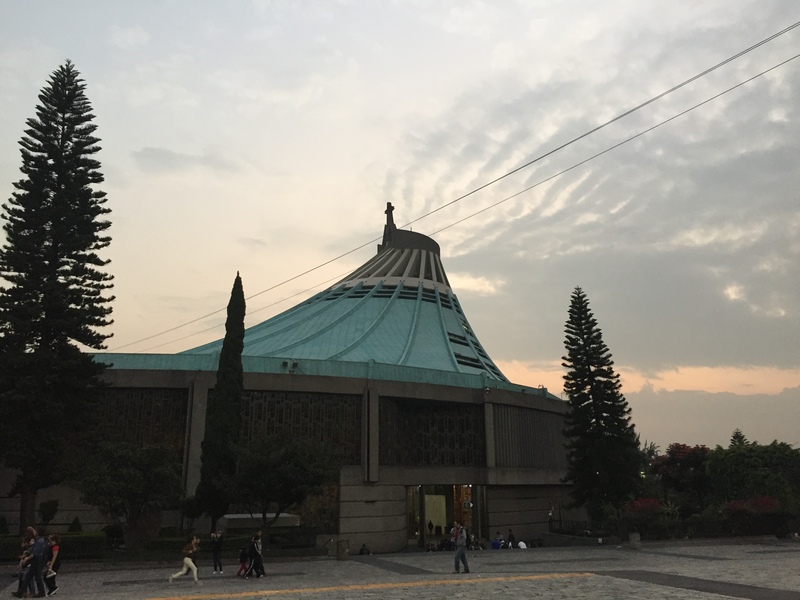 This is a very sacred pilgrimage destination for Roman Catholics and is actually the second most visited Church in the world after St. Peter’s Basilica in the Vatican! From the square where I took this photo, you can see seven different Churches from one spot. 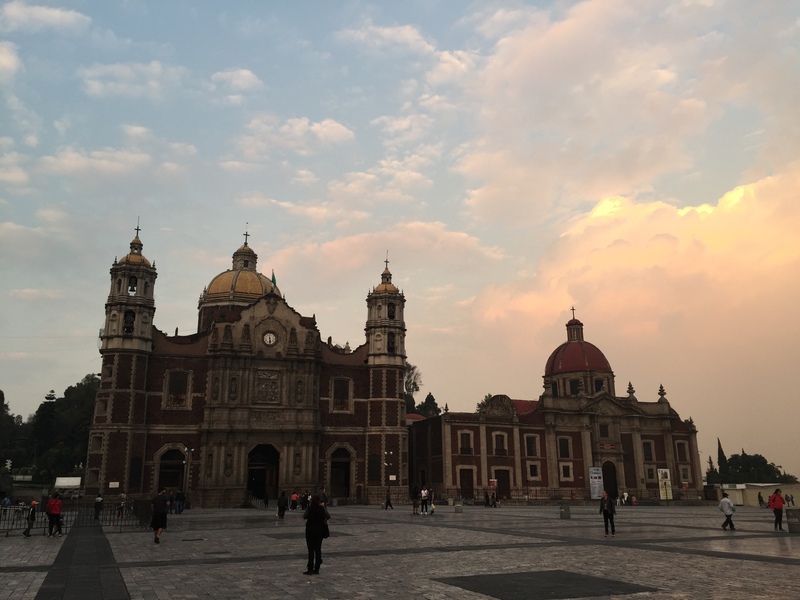 There is a famous story about a native Mexican peasant man, Juan Diego who had a message from the Virgin Mary to build a Church in this spot. He told the Bishop, but the Bishop needed some kind of proof. So he returned to the spot where he saw the Virgin Mary and she said, pick some roses and carry them back in your clock and present them to the Bishop. So he did this and returned to the Bishop and the roses fell out and there was an image on the cloak of the Virgin Mary, after this miraculous siting, and thus it became a very sacred spot and I very much felt that when I was there. I often feel emotional in Churches and let a few tears fall as I pray to God and my parents. I think I feel a particular closeness to my Mum when I am in Churches because she was a firm believer and liked to take me to Church. 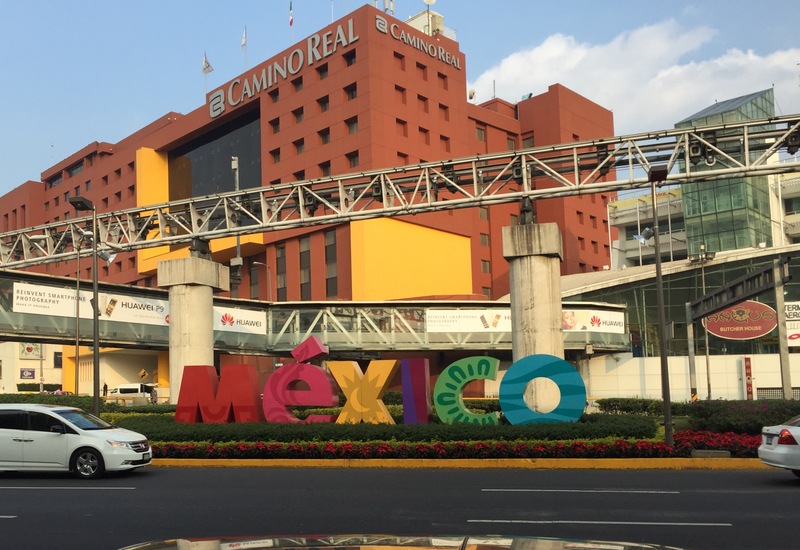 And so it was, time to pack my bags and say goodbye to Mexico City. What a special place, so rich in History. I feel like I still only barely touched the sides. Like London, it is a place that you can return many many times and there will always be something new to see and learn. I love Mexico for the heart and soul. For the way they appreciate the Mother Earth and the Spiritual Connection is very much alive in the daily life and conversation. I cannot recommend it enough and it will always have a special place in my heart.